More than 35 years ago, my parents were married. Being only 22 and 24, hoping to start their lives, they wanted to find somewhere to honeymoon that was exciting, historic and something they could love as a young couple. Even then, there were gorgeous, iconic hotels in Quebec City, as well as a rich culture wave of innovative cuisine. and I hope someday I can follow in their footsteps, as their love of Canada clearly lasted for decades. We ventured all over the place as kids, from Nova Scotia to Niagara Falls. I have vague memories of Quebec as a child and would love to return to experience it all again. It gets very cold in the winter, and snow blankets Quebec City. There’s plenty of great things to do during ths time, form ice skating to pop-up sledding. But I’m more interested in visiting when the sun shines and all the outdoor spaces are in bloom. Especially Battlefields Park, which lies on top of a cliff and features tons of historic monuments. In the summer there is an outdoor concert series at the Edwin-Bélanger Bandstand too for picnics and listening to live music. Chauveau Park is also tempting with its aerial park called Sarbaya. Nearby is the Plains of Abraham where the changing of the guards take place outside at La Citadelle. This is an iconic tradition – made a little livelier with the guard mascot also paraded out, called Batisse the Goat. Let’s talk Poutine. Yes, capitalized. I’ve only had this fries-and-gravy-and-cheese-curd combo in Nova Scotia (and outside Canada), but I hear Quebec City can claim some of the best in the country. At the Chic Shack, have the classic or spice things up with the Indian Masala variety. Or, go for the obvious at Poutineville on the other side of the city, which also boasts a huge selection all made with fresh cheeses and crushed potatoes. In other food news, you can give Patente et Machin gastropub a try for inventive deli sandwiches and an ever-rotating menu, located in the St. Sauveur neighborhood. If you rather hunt down your own foodie finds to savor right away or eat at home, visit the Saint-Jean and find J. A. Moisan, the oldest grocery store in North America. It can trace roots back to 1871. 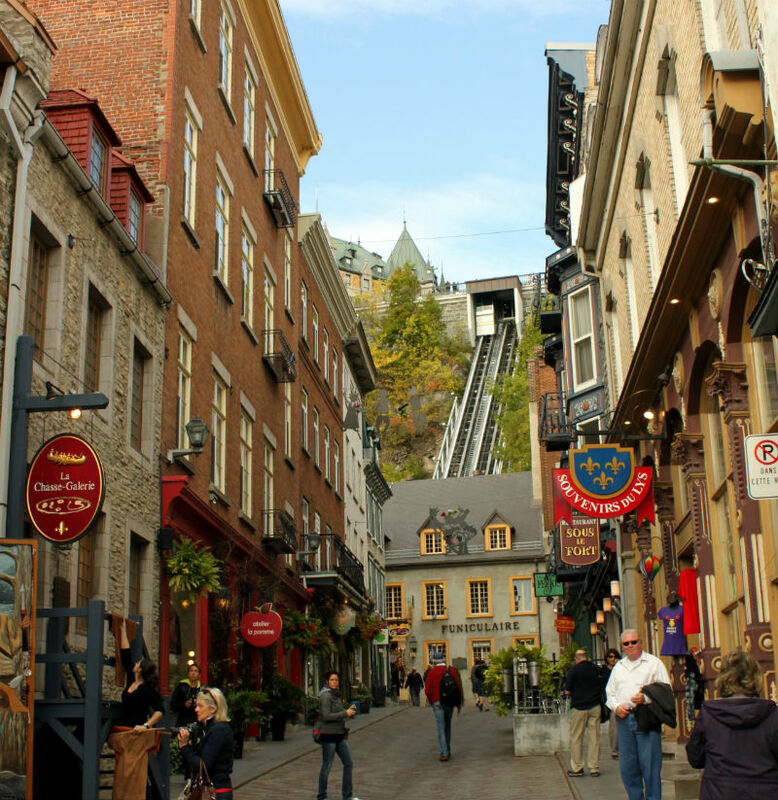 One amazing feature of Quebec City is the quick access to surrounding natural wonders. There are bountiful natural parks, waterfalls and hiking trails that can easily be visited for the day. For instance, the Parc de la Chute-Montmorency is just north of the city center and on the St. Lawrence River. There are some impressive waterfalls you can reach in a short time. Not that I’d want to pull you away from Quebec City, but Montreal is less than a three-hour drive away too and other historic spot, filled with relics from the Olympic Games in 1976. Have you been to the province of Quebec? How about Quebec City? Would you rather go in the winter or the summer?